Tortola is the grandest of the 50 or so islands and cays that make up "Nature's Little Secrets", the British Virgin Islands. Luxury villas on Tortola are easy to come by, from West End to Beef Island in the east. Little Thatch Island, home of the romantic Seagrape Cottage villa, is just off the West End. The capital, Road Town, is by far the busiest place to be on any shopping day, as cruise ship passengers, visitors and residents mingle among a variety of shops and restaurants. The J.R. O'Neal Botanic Gardens offer an enjoyable short course in the tropical herbs, plants and flowers of the island. The B.V.I. Folk Museum displays Arawak Indian treasures and documents more recent history, such as the wreck of the H.M.S. Rhone. Our luxury Tortola villas are situated just far enough away from town to offer both privacy and convenience. In the higher mountains above, a rainforest sits within the Sage Mountain National Park. On some evenings, Quito's in Cane Garden Bay offers food, drink, live music and reggae dancing by the sea, and the monthly Full Moon Party at Bomba's Shack further along the coast is legendary. But watersports are the main attraction in the British Virgin Islands, of course! Fabulous yachts out on day sails cruise Sir Francis Drake Channel, power boats speed past the out islands, and SCUBA and snorkel trips abound here. No jet skiis are allowed, keeping Tortola's beautiful beaches quiet and sublimely relaxing. Most easterly lies Beef Island, where Tortola's small airport and a smattering of peaceful residences are reachable via a small bridge. We have many Tortola villas to choose from, from darling vacation cottages to large luxury villa estates, from modest to lavish - and Tortola's West End is only a 45-minute scenic ferry ride from St. Thomas. Tortola's ambience often takes you back to the Caribbean the way it used to be, with its tranquility, easy pace and charm. Luxury Villas on Tortola... this is the life! Hospital - Peeble's Hospital (Tortola) (284)-852-7500 or Emergency Line: 284-852-7545 or 911. 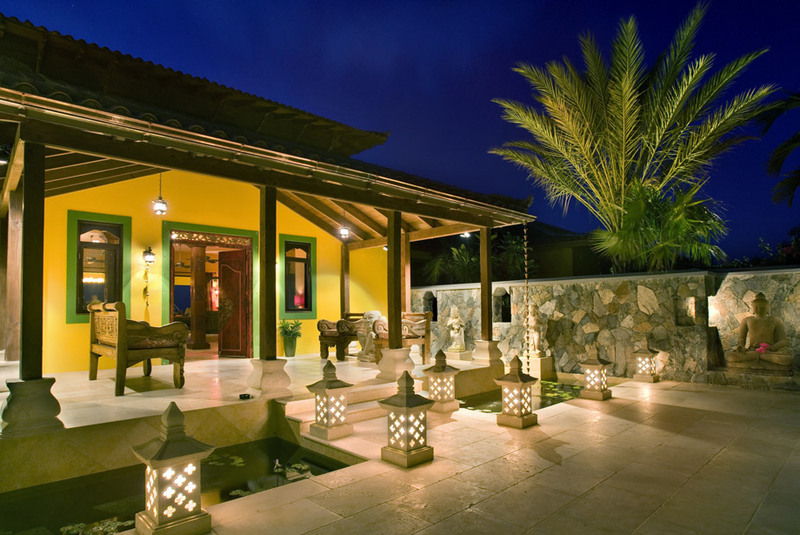 Tortola offers just the right mix of sophistication and tropical ambiance to make it ideal for luxury villa lovers. Feel free to review our list of suggested services. Tortola Cellular Phones Rentals & Service - Guests may purchase prepaid CCT Boatphone SIM cards (GSM cellular phone required) or prepaid cards at CCT Boatphone. Pre-registration is highly recommended. While many US phones work in the BVI now, roaming charges often will apply to all calls. DeDe's Prepaid Cellular Phone Services - provides the solution for visitors who want the convenience of a cellular phone on island. Email dedescarrental@surfbvi.com or telephone 284-495-2041. Stateside and other cellular phones will likely incur roaming charges. Advance registration suggested. Tortola Internet Access - Myett's Communications Center at Cane Garden Bay. Internet service, phones, messaging services, copies, faxes. Check email, news & weather in air-conditioned comfort. No shirt or shoes required. Invite one of our recommended chefs to your Tortola villa and experience a new level of sophisticated indulgence. Your taste buds will thrill to meals prepared to your specification and served with flair... or, enjoy the casual ease of a catered repast ready for you to take to the beach or enjoy on your private pool deck. For milestone celebrations, don't hesitate to ask our concierge for her suggestions for the perfect feast and presentation. Pre-stock your villa in advance of your vacation so that you can relax on arrival! We recommend Bobby's Marketplace (For deliveries to Tortola, Anegada and Jost Van Dyke, please add a $25.00 fee). Make your Tortola villa vacation extra special, with the added pleasure of a massage, manicure, pedicure, facial, body scrub, body wrap, reflexology, or the attentions of a skilled hairstylist. Service availability varies by location; advance reservations are suggested. Embark on undersea adventures that will please the expert or novice about the islands and cays surrounding Tortola. Explore sites such as Jost Van Dyke and Santa Monica Rock or the renowned Indians in the company of certified instructors, sailors and crew members who will guide you to fascinating depths of imagination and fun. Set your own pace as you snorkel, fish, dive and sail the beautiful waters of "Nature's Little Secrets"! Private yachts afford breathtaking perches from which to sunbathe, socialize, explore or say or renew your wedding vows. Your Tortola villa vacation rental is just the beginning of island adventures for you and your loved ones! Whether you are into watersports, nature hikes, or arts, entertainment and culture, if you plan carefully, a world of enchantments awaits you! Play tennis, see the sights, even swim with dolphins... on Tortola. Sage Mountain National Park - encompasses the highest point of a ridge running east/west along the spine of Tortola. The elevation of the Park ranges from 750 feet at the western end to 1716 feet at Mount Sage, which is the highest point in the Virgin Islands, US and British. The Baths, Virgin Gorda - Gigantic granite boulders and half submerged rocks line the southern seashore of Tortola, creating grottos, tunnels, and arches - swim, snorkel, and explore. BVI Festival & other Events - Calendar updated seasonally. On Tortola, commemorate emancipation with a series of activities beginning in July that culminates in the August Monday festival parade. The heart of the action is Road Town, with more events taking place in East End-Long Look and other areas, that stretch the celebration into the next weekend. BVI Music Fest - "Where the Sound of Music Meets the Sounds of Nature". International and regional stars in a grand melting pot of music. BVI Air Show: The BVI Airports Authority works in conjunction with the private sector to present a complete air spectacular, with Biplane, Skydive, Aeronautics and Model Craft segments. Beef Island Airport; shade tents, food and refreshments available. Fun for all ages!